When purchasing a new phone for yourself, an older parent or grandparent, there are a few simple features to keep in mind. If they have trouble with vision, there are accessibility options for sight-impaired individuals. There are also options for customers who may have trouble hearing. You might even be a customer who simply doesn’t want to deal with the hassle of the tricky technology of smartphones. So, we’ve picked our favorite home phones of 2018 to help you find the best traditional landline phone for you. Still Unsure About Which Landline to Buy? We love this phone for the all-around features to aid both hearing impaired and those with bad vision. Programmable buttons and a ring light are a bonus! Amplifies sound up to 20 decibels for those with trouble hearing. Can insert personal photos for programmed numbers. Simple design for those who don’t like technology. Some customers reported complaints of static or buzzing noises on higher volumes. 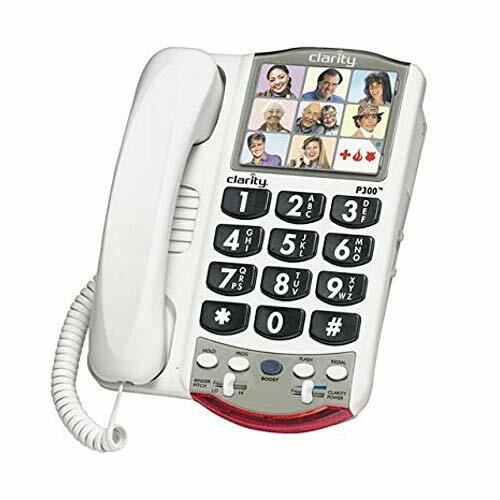 The Clarity Amplified Corded Photo Telephone makes calls louder by enhancing sound up to 20 decibels for people who have trouble hearing. The phone also has programmable buttons that can either be personalized with family photos. However, you can also simply program numbers, such as an emergency line, a pharmacy, or other useful contacts.. .
We found the bright light that indicates ringing is a great feature for hearing impaired. The buttons are also bold, large, and have excellent contrast, making them easy to identify. . This relatively lightweight phone can either be mounted on the wall or used on a countertop or table. For an overall, general-purpose home phone for those who experience issues hearing or a little difficulty seeing, this is our favorite. This phone base with a cordless handset is perfect for those who want an answering system along with the ability to add on more phones to the same line, and who also want caller ID and call waiting. Holds up to 50 calls. Speakerphones on both handset and base. ECO mode helps save energy and reduce radiation. Some people had trouble with volume performance after a few weeks. 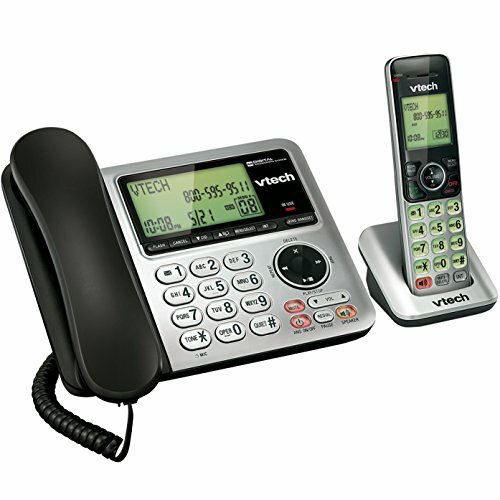 The VTech Expandable Corded/Cordless Phone System with Answering System is ideal for those who want a landline with an integrated answering machine system (it does have a voicemail-waiting light indicator). The backlit display has large numbers for easy visibility. We liked that you can use an intercom between the handset and base unit, for talking through your home or helping find a missing handset. If you’re using this in a massive home, or in an office with multiple users, this device allows you to expand your phone system. You can add on up to five handsets with the CS6609 accessory handset, all connected to the same line. Another helpful benefit is the phone’s ECO mode, a power-conserving setting to manage consumption to prolong your batteries and reduce unnecessary radiation in your home. This telephone for the elderly is ideal for emergency situations, with programmable photo buttons and an easy-access 911 button (that can be changed if needed). Ten programmable buttons for numbers. Buttons can be personalized with photos. LED lights brightly indicate ringing. Ringer can be turned on high, low, and off. Loud volume for those with difficulty hearing. Rare situations of programmed numbers deleting themselves. Some complaints of occasional issues with static sounds. 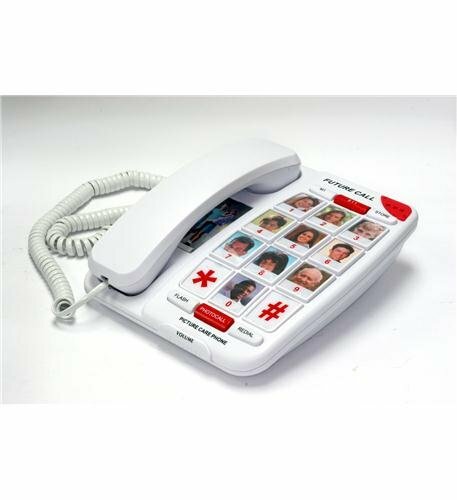 The Future Call FC-1007 Picture Care Phone with 40dB is made for those who do not necessarily need caller ID, and only want emergency calling along with 10 programmable numbers. A bright light indicates any incoming calls. The large, easy-to-see display can be personalized with photos or names. A redial button is within quick reach, as well. This phone is perfect phone for those who want the most simplistic phone design, or don’t like having a phone at all, unless using one for an emergency. . Specifically in the case of an emergency, the phone has a backup feature in which numbers remain backed up if the phone is ever unplugged or loses power. Another excellent feature for some individuals is that the 911 key can be changed to a different number for those with dementia, preventing the chance of accidental calls. When purchasing a landline phone, there are some things to contemplate. Naturally, you will want to consider the age of the person using the phone and any sight or hearing impairments. You also need to consider whether the phone will be used for regular conversation or if it will be a phone for emergency use only. Researching reviews can be helpful especially when a product has several hundred or even in the thousands. Keep in mind that all products will have some negative reviews. These are sometimes attributed to incorrect product use, not reading the manual, or improper hookup. It’s estimated that a staggering 95 percent of all returned gadgets in the United States actually work, regardless of what customers say. The fault is often in improper use or just not reading the manual. With some devices such as the VTech model, there are occasionally special requirements. For example, if you have DSL, you may need a DSL filter. If there are particular health conditions in your situation, and you are purchasing a phone for someone suffering from something like dementia or Alzheimer’s disease, think about every possible scenario they might encounter. Ask yourself if they will accidentally call emergency numbers if the phone is programmed to dial 911. If an illness as such is new to your family, you can look into the stages of things such as Alzheimer’s and decide along with their physician how quickly symptoms are progressing. If your loved one is in an early stage, they might be quite capable of handling a more typical home phone. If your loved one lives in housing where neighbors can potentially hear through the walls, but your friend or family member is severely hearing impaired or deaf, you will need to make the decision about ringer volume. Will the ringer volume need to be loud? Can it be turned off entirely and give clear instructions for your loved one to check regularly for a voicemail-waiting or incoming call light? With some devices such as the VTech model, there are occasionally special requirements. For example, if you have DSL, you may need a DSL filter. Most of these phones also have batteries that either need charging before use or require batteries that are not included. Don’t forget to check the set-up requirements when you glance over the features. It’s also important to think about where the phone will be located. If it will be near a bedside, will a bright backlit display be a benefit for dialing in the dark, or will it be a detriment to sleep? Ask yourself these questions and consider you or your loved one’s specific situation. Then you will be much more informed about finding the right home phone for you or an elderly member of the family who needs a phone for emergencies. If you’ve covered these questions are just want a general telephone for essential use, the ability to dial, and also the benefits of programmable buttons, amplified sound, and an incoming call light we love the Clarity telephone. It has dialable buttons so you can call numbers other than the programmed people. So, it can be used as a regular phone. Yet it also has the perks of large buttons, a ringer light, amplified sound, and auto-call programming for a handful of people of your choosing.